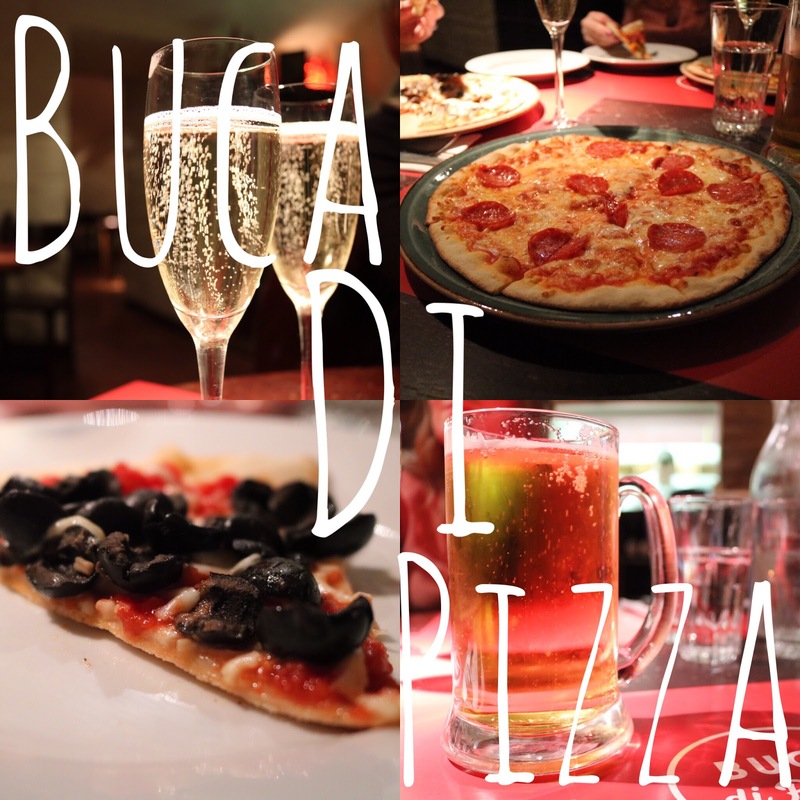 I'd heard and seen a few things about Buca Di Pizza on social media, it hasn't been massively over-hyped or yelled about too much and it hadn't made it on my 'places to go' list... until I was told about their £20 all you can eat Pizza and Prosecco deal, which catapulted it to the top of my eating agenda; a table was booked for three at 3pm on a Saturday afternoon. Buca Di Pizza lies in the former residence that was the well loved La Grillade; a French restaurant that up sticks and left when rents became unreasonable. The place it resides is like an underground wine cellar (a massive one) with alcoves and echos running through it. We browsed the menu but failed to see the pizza and prosecco deal, when booking I was reassured this would be available and so I asked how we secured such deal. It was explained to us that we simply chose a pizza each, they could cut it into slices for us to share if we liked, and then when we were done we could order more. The drinks were not limited to prosecco but also beer (their own lager) and soft drinks. A small catch (which I think has been recently introduced) is that you can only have the table for 90 minutes... therefore can't stretch out the unlimited booze for hours on end. Sensible. The girls opted for prosecco and myself (weary of bubble headaches) opted for the beer. It wasn't too bad for a house lager and it came in a big man pint complete with handle, perfect for making me feel like the butch one of our group. I didn't sample the prosecco so I couldn't tell you if it was any good but the girls seemed to like it and managed to sup away at a few glasses. The waiters weren't ever present so it wasn't always easy to get your glass re-filled and I was told to holler if I wanted another beer. It was felt that there was a slight bias towards the larger group of girls and they did seem to have had enough prosecco to make them uncontrollably giggly and shrieky. In total we managed to make our way through 5 (with a few slices left over at the end) pizzas. The pizzas have a crisp base, creamy cheese and some good quality toppings I wasn't disappointed by them at all. The pizzas that made the bill that day were: Pepperoni, Diavola, Funghi, Quattro Stagioni and Spring Chicken. I've only pictured some of the fore mentioned pizzas, because a pizza is a pizza at the end of the day and I'm also still trying to perfect how to take an attractive picture of them... they're just so damn flat and unphotogenic! My only criticism on the pizza, isn't really a criticism but more a cautious tale... if you order the Quattro Stagioni be prepared to fight it out between your diners as the four ingredients are arranged on the pizza in clusters, as you'll note from the picture above that particular slice consisted of only olives. This worked out well for me as I am the only one of our group that likes olives but a fight could have ensued over the remaining toppings if we weren't such good friends. A recommended place to go if you have a large appetite and can drink your way through a litre of prosecco or beer in 90 minutes, or additionally if you're going with a large group as it makes splitting the bill so much more easier.